As I've said before and as my friends have joked about, I fancy myself a pretend private detective. In reality, I'd probably be awful because at least once a month for the past 10 years a stranger has said to me, "Hey, you look like / remind me of my [insert one here] cousin, cousin's friend, friend's cousin, roommate from college, roommate's cousin . . . " I almost always reply "I get that a lot." Yet again, I am reminded that being a parent often lends itself to some private detective skills and I might actually be able to make some money off these skillz some day. This morning, Ramona awoke at 7:15am (about 30 minutes earlier than she normally does). This is usually my crunch time where I am getting ready and/or packing lunches, emptying the dishwasher, etc. I SERIOUSLY cannot have kid company during this time. I was able to convince her to go back to sleep, but she definitely seemed unsettled. Then tonight, I was singing her one of her songs that references "when fairies sing." Her eyes opened wide and she said , "I don't want the fairies to come in my house." I said that no, the fairies stayed outside in the woods and then made up a song to the same tune that focused on how the fairies live in the woods and they don't come in unless you invite them. She kept talking about it and I started wondering if her early awakening this morning was due to a bad dream. I put her in her crib (oh yes, still in a crib at 3 years, 2 months) and went to hustle Beezus along to bed. A few minutes later, Ramona was talking animatedly (which is unusual) so I went back in. What I was able to deduce from her tirade was that she didn't want the tooth fairy to come into our house. And like a Tetris game, the pieces fell in to place. 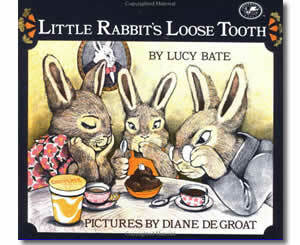 Beezus' current fave book is Little Rabbit's Loose Tooth, one of my own favorites from childhood. Evidently, at some point, Ramona either overheard the book or participated in listening to it. Clearly, it is too much for her to handle. I definitely think that she had a bad dream this morning, and there's a good chance that she is afraid of fairies right now. In general, I find it completely and utterly useless to tell my kids that their feelings are wrong or unreasonable. When Beezus went through a scary monster phase, I never said that monsters were friendly. Instead, I would say that I gave the monster some money and he went to get pizza and ice cream, so he wasn't home. So this time, I didn't even bother telling Ramona that fairies were nice and that she didn't need to be scared of them. Instead, I reminded her that fairies live in the woods and they can't come in unless you invite them, and that the tooth fairy won't come until Beezus loses a tooth. Furthermore, when Beezus DOES lose a tooth, we can put the tooth outside and the tooth fairy won't even have to come in our house. Ramona liked that and elaborated on my story by listing the different places we could put the tooth and that we could put a sign on the door for the tooth fairy. 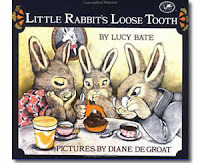 If this is what it's like when we're just reading books about a loose tooth, I can't wait to see what it's like when Beezus actually has a loose tooth ! I remember when Monkey was little and he was terrified that a big red monster was outside his window and trying to get. In the end, I explained that he had come to see if anyone wanted to play but that I said no and told him to go home. I called his mom for him and she came to pick him up. For whatever reason, it worked. Anytime he thought he heard a monster, he'd ask me to call it's mommy and that always took care of it. You never can tell what a child is thinking! Hey, Sophie is still in her crib (3 years, 5 months) and will be residing there for a while yet apparently. And Sophie, being Sophie, actually likes to keep monsters under her crib and has never taken me up on the offer to remove them. Supposedly they protect her from the really bad monsters.